The country has its own rules of the road and signs that explain these to drivers. But the likelihood is that not all those British drivers know what they mean. We’ve compiled 10 of the better known French road signs in this quiz. For first time visitors, it’s a chance to familiarise yourself with what you’ll be seeing road side. And even regulars might enjoy refreshing their memory. If you don’t get all the answers correct at the first attempt, try again – and remember to click the “Finish” button again. Bon chance! #2 If you see this sign, which road has priority? #3 When are you likely to see this sign? #5 Where and why would this sign be displayed? #6 Which road shown in this sign has priority? 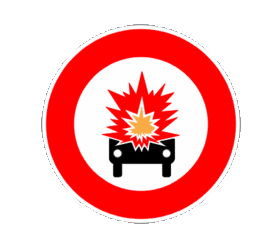 #7 If this sign is displayed, which vehicles are permitted to enter? #8 If shown at a parking bay, when is parking not permitted? #9 What does this French road sign mean? Très bon! You’re fit to drive in France. Bon voyage. It refuses to change when you have another go at it now I’m totally confused. Originally had one incorrect answer. Still keeps your original reply which may be incorrect so chose another, but still said it was wrong. Now messed up the whole quiz. Please make sure that you press the ‘Finish’ button after changing any of your answers; that should do the trick. Good luck with the quiz! I am surprised. May be you should pay more attention. I see them all the time. Well done green flag, this should be compulsory for insurance cover. I scored 10,by the way. I got them all right but the score was only 8/10. Connards! Good quiz to get one to get a French Highway code book. I will get one . For someone who hasn’t driven in France for 20 years 80% correct is not bad! How many people would get any right if there wasn’t a multiple choice of answers ? You wouldn’t have that choice whilst actually driving over there would you ? If you do intend driving abroad I suggest you familiarise yourself using the relevant code book for any country beforehand, and it wouldn’t be a bad idea to re familiarise yourselves with British one now again either, things change and others are added over time. Good quiz,I will now buy a French Highway Code. Good quiz! I got three wrong so I’m sulking. To get my own back, I’m correcting your French … it’s BONNE chance, so there! Never been to France 6 out of 10 no bad, lol.